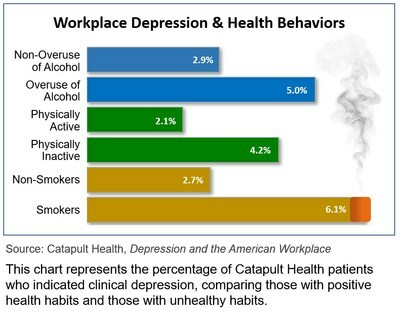 DALLAS, March 27, 2019 /PRNewswire/ -- Some segments of the population are much more likely than others to suffer from depression according to an analysis of more than 157,000 preventive health checkups conducted by Catapult Health in workplace settings across America. Millennials, women, smokers, those who are overweight or physically inactive and those with a chronic health disease are at highest risk for having depression. These patterns extend beyond depression to suicidal ideation—individuals who have a plan and the means to end their own lives. The analysis found that workers under 30 are significantly more likely to suffer from depression than their older coworkers. Depression affected almost three times as many millennials compared to their boomer counterparts. Other findings include cigarette smokers are more than twice as likely to have depression compared to non-smokers. Similar ratios were found between physically inactive and active individuals, and those who overconsumed alcohol compared to those who did not. The Catapult analysis aligns with previous studies that report depression as a common comorbidity with other physical issues. Individuals with hypertension, diabetes, coronary artery disease, heart failure and chronic obstructive pulmonary disease (COPD) are more likely to experience depression. Those with heart failure and COPD had rates more than twice that of individuals without those diseases. A direct correlation was also found between obesity and depression. The more obese a patient was, the greater the likelihood of having depression. Individuals who were underweight (body mass index < 18.5) also had higher rates of depression, similar to those who were obese. Depression is a serious and growing health problem in America, affecting as many as 19 million adults, according to the National Institute of Mental Health. "Without proper screening it can go undiagnosed for years, which is a major reason why over 80% of those who have symptoms of clinical depression are not receiving any specific treatment," said David Michel, CEO of Catapult Health. Depression screening is now recommended for all adults by the U.S. Preventive Services Taskforce and is included in all Catapult Health onsite checkups. Data in the analysis are taken from profiles Catapult Health captures of employees working at companies nationwide. The profiles include a wide range of both physical and mental health indicators and provide insight into the current well-being of American workers. For a copy of the report or for more information about Catapult Health, access www.CatapultHealth.com. Catapult Health conducts preventive care checkups at the workplace using both onsite and telehealth resources. Patients receive their blood chemistry, depression screening and other test results in real time, in consultation with a board-certified Nurse Practitioner.